As a leader I am very aware of my weaknesses and failures. Being in front of others brings a feeling of amplification of those areas. I am also very aware of the impact they have on others. That awareness helps to keep me accountable but it also stirs in me a temptation to hide those things. There are lots of people who look to leaders as perfect people. Flawless. They put them on pedestals. It’s easy to be caught in that and feel like you have to maintain this perfect image and pretend to be superhuman. You want to be their hero. You want to be the one to save them and make everything better. Who else could do that but a perfect person? This is so true and I am not him. Neither is any other leader on this earth in bodily form today. There is only one true hero and only one that can save and His name is Jesus Christ. He can use me, yes but not to save anyone. That work has already been done on the cross. He uses me to love like He loves. I get to be his hands and feet on this earth today. I point the way to the true hero. In order to do that, it means I have to first and foremost recognize that I am not Him. I have to make sure no one is putting me on a pedestal that I do not belong on. I have to make sure that I am not putting myself on a pedestal that was never intended for me. An easy way to do this is to be open and accountable with my faults. This doesn’t mean my failures are on auto-post to social media, but it does mean I have an accountability team that know my inner workings. It also does mean that I am real with the people I lead. I find that the more real and open I am about my pain and about my screw ups. The more people can relate to me. It’s how I relate to Jesus. He was fully human. He was tempted, he felt afraid, he was alone. He hurt and bled. I can relate to that. Jesus was the perfect human and He is also the perfect God. Without Him being God, His work on the cross is just a sad waste of a perfect life that shouldn’t have been ended. Him being God and coming to earth, then dying for my sin bridges the gap that exists between my Holy and Perfect God and this sinful human. He saves me from my sin and failure. 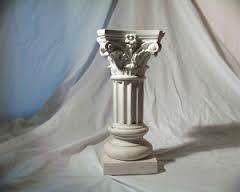 That deserves a place on the only pedestal.